Nature abhors a positive feedback | Watts Up With That? The purpose of the article is to contribute to refuting the false alarm that has been generated worldwide about excess global warming caused by atmospheric carbon dioxide, primarily by mischaracterizing its inherently negative feedback. Feedback is the effect that the result of a process has on itself. Positive feedback augments the result and negative feedback diminishes it. A negative feedback does not preclude an increase in the results of a process but it does limit the ultimate magnitude of the increase. Most feedbacks in nature are negative or soon become negative. Otherwise we would have been destroyed by nature some time ago. Positive feedbacks can cause runaway effects. Nature abhors a positive feedback. A mathematical definition of feedback is derived from the following schematic. where A is the output with no feedback. This is the standard expression for electrical circuit feedback. If f approaches +1, a “tipping point” is reached where the amplification attempts to become infinite. Such a tipping point is the basis of the warming advocates’ claim of a runaway catastrophic warming which is frequently cited as evidence for their climate-change alarm (1). But negative feedback prevents such a runaway. 1) Saturation whereby CO2 absorption diminishes the energy content of the emitted IR leaving subsequent CO2 additions with less energy to absorb which diminishes the overall absorption per molecule. Saturation affects the process and all greenhouse gases saturate. 2) Water vapor from surface evaporation caused by the CO2 warming that can change to liquid or ice phases and can theoretically increase warming because water, like CO2, exhibits a greenhouse effect in all of its phases. But both its production and its presence also cool the atmosphere. Water in the atmosphere in any of its three phases is a universal inhibitor of global warming, yet it is totally mischaracterized by the global warming community as having a significant positive feedback. Despite evidence to the contrary there is a considerable body of opinion that water-vapor feedback is positive. But the negativity of the saturation feedback is not questioned. 3) Removal of CO2 from the atmosphere. It is shown in this article that the atmospheric CO2 level fails to keep up with the amount inserted therein. The fraction which is permanently removed quickly surpasses the fraction which remains and its increase continues after insertion stops until equilibrium is achieved among the carbon reservoirs (atmosphere, land and ocean). There are a number of reports that compare measured time-dependent input CO2 with corresponding increased CO2 level in the atmosphere. Most of these report that the atmosphere loses about fifty percent of what is inserted (less than that calculated here). However, quoting directly from Reference 2: “Over the long term (millennial timescales), the ocean has the potential to take up approximately 85 percent of the anthropogenic CO2 that is released to the atmosphere.” And this excludes any possible permanent removal by soil and plants. This analysis shows that soil and plants remove much of it in the short term. By the analysis of this article, removal has a significant negative impact (illustrated in Figure 10). The world carbon balances typified by the three in Appendix A are all close to that of the Woods Hole Balance of Figure A-3 which shows 100 petagrams (pg) of carbon exchanged each year with both the ocean and the land with its vegetation. The negativity of the main three feedbacks is shown graphically in Figures 1, 2 and 3. Figures 1 and 2 are illustrative, only, to portray negative feedback. But Figure 3 results are actually used in the calculations of predicted maximum temperature rise. The rate of change of negative feedback typically diminishes with time but the overall decrease in output never ceases, as shown in the figures. This is the well-known asymptotic change which continually approaches, but never actually reaches a constant limiting value. These three mechanisms are the major feedback mechanisms; they originate completely within the atmosphere and they directly involve CO2, the object of the warming concern. Forcing functions of Figures 1 and 2, in watts per square meter deposited in the atmosphere (the driver of warming) per added unit CO2 or water vapor are calculated by the Modtran computer code described in Appendix B. These are proportional to temperature rise produced. Figures 1 and 2 demonstrate the universality of the negative feedbacks of both CO2 and water vapor. For any combination of atmospheric content of CO2 and water vapor in each figure THE INCREMENTAL TEMPERATURE FORCING FUNCTION IS REDUCED BY INCREASING THE CONTENT OF EITHER. This is an important observation because it defines negative feedback. Reduction of the incremental forcing function does not eliminate the forcing function, as shown in Figures 5 and 6, but it does place a finite upper bound on it. A recent study at the University of Alabama at Huntsville (UAH) confirms this negativity of feedback from atmospheric carbon (3). The negative impact of atmosphere removal is best illustrated by plotting the fraction remaining of atmospheric CO2 input versus time as in Figure 3. The CO2 input to the atmosphere ceases at 1000 years when fossil fuels with their carbon content is determined to be depleted by the model of this article. CO2 removal continues until equilibrium of all the biosphere reservoirs is reached. Figure 3 indicates a variable rate in the increase of the removal and the removal continues until the biosphere components equilibrate. Figure 10 indicates the relative contribution of the biosphere’s carbon reservoirs to this removal. Negative feedbacks normally reach a constant limit asymptotically. CO2 removal achieves it when the biosphere reservoirs reach equilibrium following cessation of CO2 input, which is assured by the assumption of this model that reservoir expulsion rate is proportional to its content. That feedback, however, can actually continue at a very low level as shown in Figures A1 and A2 wherein some carbon from the atmosphere is shown to be continually and permanently deposited on the ocean floor. Water vapor feedback exactly fits the feedback alteration of the input shown in the feedback schematic. The greenhouse-gas (ghg) atmospheric heat from CO2 produced water vapor can also heat the atmosphere by its own ghg effect. But its production removes more heat from the atmosphere than its added ghg effect can replace. Its presence also cools the atmosphere (see Figures 5, 6 and 7). It has its own negative saturation feedback and also augments CO2’s negative saturation feedback. The analysis presented here shows that it has a universal and significant negative feedback. Saturation doesn’t change the ghg input but it does alter the “process” negatively by reducing the heating effect of the individual molecules. Removal obviously reduces the number of input molecules as shown in Figure 3 and it reduces maximum possible temperature increase from 2.45 down to 0.98 oC. The IPCC has generated world-wide clamor to curtail carbon dioxide (CO2) production in order to prevent alleged CAGW which relies on the claim that significant positive temperature feedback exists from adding CO2, in contrast to the evidence presented above. Without such a claim there would be no case for a runaway temperature, or “tipping point” (1). Negative feedback does not prevent CO2-caused temperature rise but typical IPCC results, as shown in Figure 4, significantly over-predict measured temperature increase. This article presents defensible data with a ‘limit analysis’ (described below under CALCULATIONS) showing that CO2 feedback is sufficiently negative to preclude unacceptable warming. IPCC calculations and explanations of their results are not consistent with physical science. Figure 4 shows a comparison of predictions and measurements of world temperature increase for this century. The blue curve is from an average provided by Roy Spencer and John Christy at the University of Alabama at Huntsville (UAH) of 44 separate calculations of warming by various researchers (4) and noted by Spencer that “it approximately represents what the IPCC uses for its official best estimate of projected warming.” The pink curve is by converting the net forcing function across the atmosphere from added CO2 as calculated by the Modtran computer code (described in Appendix B) to temperature increase. The conversion formula is described under CALCULATIONS: Temperature Rise. The input CO2 values used for this method are from the well-known measurements at Mauna Loa, commonly called the “Keeling” curve (5) whose accuracy is universally accepted. UAH regularly publishes the national satellite temperature measurements made. The yellow curve is from UAH satellite data and the green curve is from surface measurements by The Goddard Institute for Space Studies (GISS). These two curves are the results of a linearized least-squares fit to the actual data (6). 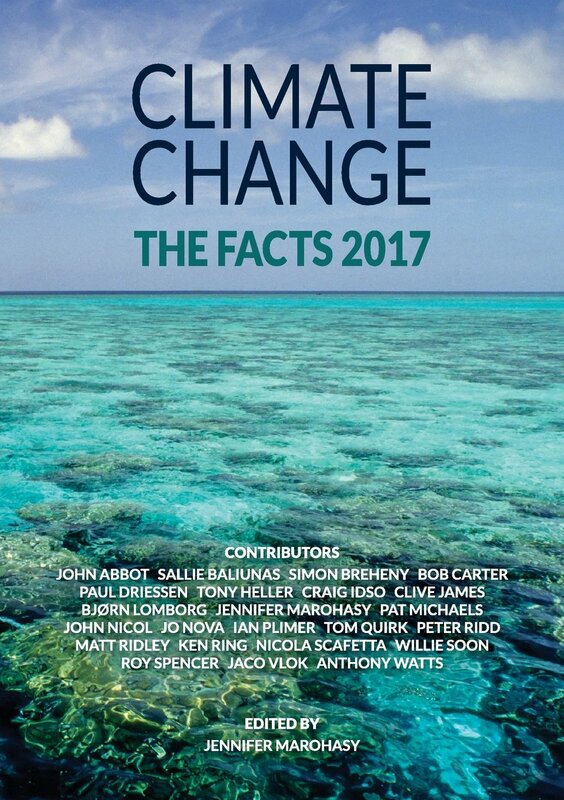 The average of the 44 values from the IPCC contributions exceeds the average of the measured values by a factor of seven, but the computation method of this article matches them very closely. 1. The seeds of the IPCC’s global warming bias were planted in its UN charter: i.e., to assess the scientific basis of human-induced climate change (7). Any finding of an insignificant scientific basis would end the IPCC and its promotion of munificent research contracts. 2. As indicated above, the negative feedback for CO2 insertion precludes the possibility of the claimed “tipping point.” IPCC’s temperature predictions are much too high (Figure 4). IPCC is a primary source of unwarranted CAGW alarm. 3. 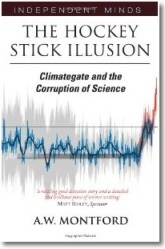 The well publicized emails from contributors to IPCC research known as the “climategate” scandal of November 2009 (8) revealed undeniable scientific malfeasance in preventing publication of dissent from their theories, in concealing their methods and in data manipulation as well. Unfortunately, these are still major strategies employed in promoting CAGW alarm, but mere stifling of dissent messages has now been elevated to attempted destruction of the careers of dissenters. 4. IPCC’s 5th assessment report (AR5) shows lower temperature predictions than the previous report (AR4) and has even increased the range of uncertainty for climate sensitivity (see item 7 below) yet it has increased its claimed level of certainty of future higher temperature-rise predictions over that claimed for previous reports in direct contradiction of its own results. 5. IPCC’s temperature prediction for this century alone exceeds the level that can be achieved over any time period even if the world’s fossil-fuel reserve is completely consumed in that time. (see Table 4 and Figure 18). Maximum temperature increase stays below 1o C.
6. The claim that we have a limited time for action on climate (i.e., that we will “lock in” a future temperature increase without immediate action) is false. 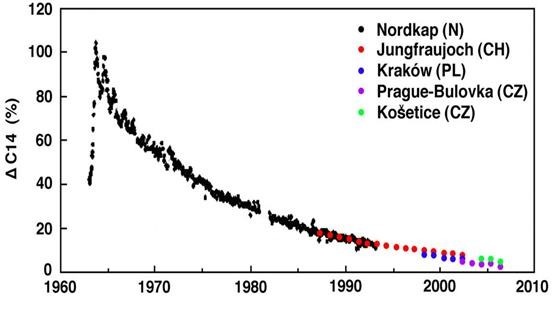 As soon as the input to atmospheric CO2 is decreased (as, for example, by running out of fossil fuel) temperature decreases along with it no matter what CO2 level and temperature are reached in any given time frame (see Figure 18). 7. IPCC has made an issue over a parameter called Climate Sensitivity (CS), which is defined either by the temperature increase from doubling atmospheric CO2, or the temperature increase per unit of induced climate forcing function, (w/m2)-1 across the atmosphere. It has no intrinsic utility, but has had an impossibly high range of values ascribed to it, apparently for use in magnifying the true warming capability of CO2 (see CALCULATIONS: Climate Sensitivity). 8. The current popular hypothesis among supporters of global warming, that the recent hiatus in surface warming is due to an increase in the fraction of heat that is being stored in the deep ocean and that “the heat will come back to haunt us sooner or later,” is totally unsupported by the laws of physics (see CALCULATIONS: Ocean Stored Heat ). 9. The maximum possible achievable CO2 is far below the level of harm to animals and as well as well below the optimum level for plant growth and health. (See CALCULATIONS: Effect of CO2 Levels). 10. Over-predictions of achieved temperature increases published with the approval or the sponsorship the IPCC are as pervasive as they are large. If these were unbiased calculations there should be approximately as many under-predictions as over-predictions. Both data and analysis strongly contradict the claims being made for alarming global warming caused by CO2. The magnitude and prevalence of the over-prediction errors are sufficient to impugn the objectivity of the claimants. A limit analysis means that instead of attempting to accurately model all the factors involved in calculating CO2-caused temperature increase, a model is generated that can be accurately calculated and that can be reasonably assured not to underestimate the true temperature rise. Results of such studies are useful for policy making. The following limits apply for the calculations of this analysis. 4). But, instead of stopping with that extreme upper limit, this analysis backs down from that to an increase which is still a credible upper limit by allowing more and more of the biosphere to participate in the receipt of atmospheric carbon to the point where there is no more decrease in the maximum computed atmospheric temperature, and that is used for the temperature limit of what CO2 increase can ever achieve. That point is reached before the complete biosphere (which means all of the atmosphere, land and ocean) are included among the recipients. It is reached by allowing all of the atmosphere and land plus only about the top 15% of the ocean to receive atmospheric carbon. Its value is 1oC. 2. Heat transfer out of the atmosphere is assumed to be limited to outer space. No credit is taken for heat transfer to the rest of the world (land and ocean) which actually occurs and cools the atmosphere because of its vast heat capacity. The assumption avoids complexity and the reliance on questionable parameters while assuring a conservative value of atmospheric temperature rise. (See Reference 9). 4. This analysis claims no negative feedback from CO2 creation of water vapor. The heat of vaporization required to create it is a negative input but is approximately replaced when the vapor condenses at higher altitudes and to a lesser extent by the ghg heating effect of water vapor. 5. The carbon input to the atmosphere is assumed to be larger (at 10 petagrams per year) than any so far recorded, all from fossil-fuel and continuing at that maximum rate until world fossil carbon is consumed. The world fossil carbon level used is highest of the carbon balances listed. A limit analysis cannot be divorced from human judgment. But neither can the complex models of the IPCC (general circulation models, GCMs) which rely on a great number of poorly known parameters. The climate is too poorly understood to be analyzed with extreme precision. Limit analysis is a valid check on attempts to model all contributing factors in the IPCC analyses. In this regard Table 3 shows the results of using even more conservative assumptions. The highest of these results barely reaches the lower limit of the IPCC temperature prediction just for this century. Not all of the water in the atmosphere can be attributed to feedback from greenhouse gases. Most of it got there by other mechanisms. It is appropriate to separate such water vapor (called “existing” water vapor) from that which is produced specifically by CO2 addition (feedback). The effects of water vapor and clouds on CO2’s temperature increase are shown in Figures 5, 6 and 7.
as shown by the figure, since their atmospheric temperature rise slightly exceeds the clear-sky level because their reflection of incoming light is limited. Such sub-visual cirrus clouds are so rare (11) that their average effect is negligible. The average net effect of increasing water in any phase (vapor, liquid or solid) and by any means is one of cooling. Figure 5 and 6 results are calculated with Modtran (Appendix B) and Equation 2. Figure 7 shows an undeniable negative correlation between extent of world cloud cover and world temperature. Changes in ocean surface temperature that are caused by ghg heating from water vapor can produce more water vapor for a potential positive feedback. But there is an approximate net zero effect from the heat drawn from the air to vaporize the water because that heat is returned when the vapor condenses (cloud formation). Of course, cloud formation has a net cooling effect as shown in Figures 6 and 7. Any direct feedback from ghg-formation of water vapor is appropriately ignored. The vapor produced by the CO2-produced ghg heat is calculated by the method developed by Wolff (13) that transmits ghg produced heat in the atmosphere into the ocean. Tabulated results of the Clausius-Clapeyron Equation (Table 2 of Reference 10) or similar relations are used to determine resulting water vapor for the Modtran input for iterations between heat-produced vapor and vapor-produced heat. Vapor pressure of water is dependent only on its temperature. 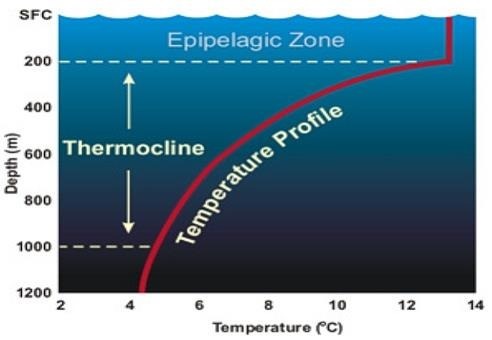 Temperature is virtually constant (=earth surface temp) in the epipelagic zone of Fig. 8. Greater assumed depth has little effect on vapor pressure. where kλ is a constant specific to the component and wavelength. Although the constant kλ for CO2 in air varies greatly throughout the infrared range, the influence of Beer’s Law can be seen by analysis with programs such as Modtran (Appendix B). The decreasing slopes of the curves in Figures 5 and 6 are the results of Beer’s Law (saturation). The current atmospheric CO2 is already well saturated. There is no argument against the negativity or the magnitude of this feedback. The feedback graphs of Figures 1 and 2 (which are basically of saturation) are calculated by Modtran, not by Equation 3. A warmed ocean releases CO2 through Henry’s law (15) as depicted graphically in Figure 9. A limit analysis that allows all atmospheric ghg heat from CO2 to be deposited in the ocean shows the insignificance of this feedback. In the vicinity of average ocean temperature (15o C) Figure 9 shows carbon dioxide solubility decreases by 0.085 g of CO2 per kg of water per deg. 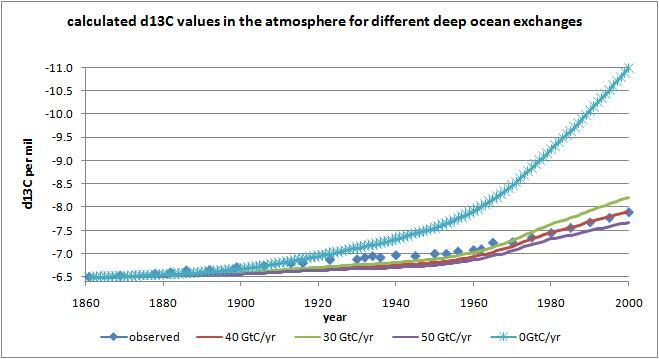 C of water temperature increase (the ocean’s greatest rate of decrease). A one-degree change of a kg of water is a kilogram calorie. The weight of a 1 m2 column of air at the earth’s surface is 10,357 kg. A Modtran derived forcing function across the atmosphere plus equation 2 shows a temperature increase to the atmosphere of approximately 0.75 oC for doubling from 400-to-800 ppm, or increasing its heat by 7768 calories. Conservatively assuming all of that heat is transferred to the ocean produces 470 grams of CO2 in the meter-squared atmosphere column using 71 percent of atmosphere transferring to the ocean. 800 ppm of CO2 in the atmosphere weighs 125,000 grams per square meter on the surface. A 470-gram increase above 125,000 is the same fraction as 3 parts per million (ppm) above 800. With the extreme conservatisms built into the analysis, this value is truly negligible. Feedback from water and from saturation is determined within the Modtran code because the results are dependent upon the input of water-vapor and CO2 levels and climate conditions chosen. That from CO2 removal must be determined separately to govern the CO2 level chosen for input to Modtran. The negative removal feedback is significant, generally ignored and probably the least studied. The reason it is significant is that the atmosphere has but a small fraction of the carbon in the earth’s biosphere, about 2 percent, as illustrated in the three world carbon balances of Appendix A. It exchanges its carbon with the remainder of the biosphere at more than twenty times the rate that man’s fossil-fuel combustion has ever been able to put carbon into it. The figures in Appendix A show that carbon dioxide molecules cross the biosphere boundaries in both directions. All CO2 from fossil-fuel combustion goes into the atmosphere, but the atmosphere ultimately keeps but a small fraction of it. The time-dependent solution for the CO2 content of the biosphere reservoirs is required to determine the removal of CO2 from the atmosphere. The net transfer across the boundary between adjacent reservoirs A and B from A to B is the expulsion rate from A minus that from B. A key assumption in the solution is that the expulsion rate out of any boundary of any reservoir is proportional to the content of that reservoir which requires that there is a time-invariant mean probability that a molecule will escape through any boundary in a unit time. That is true if the relative spatial distribution within reservoir is invariant with time and that requires short transit times across the dimensions of the reservoir. The land reservoir is modeled as a surface phenomenon, with vertical transmission which assures 0 transit time. In the atmosphere the average Maxwellian velocity of the molecules is roughly 300 m/sec allowing a path traversal equal to roughly 15 atmospheric depths in an hour which would explain the constant relative concentration (parts per million – ppm) of CO2 with altitude. The very short horizontal transit times are verified by the Keeling measurements of atmospheric CO2 at Mauna Loa which display semi-annual plant-produced variations in CO2 level essentially as they occur, but Mauna Loa is half the Pacific Ocean removed from the world’s major plant activity. CO2 dissolved in the ocean travels with the ocean water which is glacially slow compared to atmospheric molecular velocities. When atmospheric CO2 is absorbed by the ocean, only 0.6% remains as dissolved molecular CO2, the remainder is converted to bicarbonate ions and much less to carbonate ions. All its forms are subject to transport by a variety of vertical and horizontal ocean currents as well as by diffusion and simply by falling to the ocean floor (as dead phyto- and zoo-plankton). A model which captures all these effects would be impractical even if they were well known. But it is possible to define and calculate defensible bounding limits that allow an approximation of the associated time and space distribution of the carbon emitted from the atmosphere. The dissolved CO2 is governed by Henry’s Law (15)which expresses the relationship between the partial pressure, P, of atmospheric CO2 and its concentration, C, in moles per liter in the ocean as dissolved in the ocean. where K is the temperature-dependent Henry’s Law constant. Its temperature dependence is sufficient that arctic waters can dissolve more than twice that of tropical waters which produces a net exchange in different parts of the ocean-atmosphere boundary that is in the opposite direction at the same time. The Woods Hole model of Appendix A is the basis for the time studies presented here because it is the most conservative of the three—having the largest fossil carbon reservoir and greatest input rate to the atmosphere. Its total biosphere has 43,620 petagrams (pg) of carbon and comparison of the three balances shows the exchange between ocean and atmosphere and that between the shallow ocean and the deep ocean to be approximately 200 pg per year. That determines a maximum size of 200 pg for the individual ocean reservoirs modeled. That transfer rate is assumed to be maintained throughout the ocean. Fortunately, Microsoft’s EXCEL spreadsheet has the capability to solve over 200 simultaneous difference equations over a time span of thousands of years. (See Figures 12 through 17). These figures demonstrate the great time delay for carbon exiting the atmosphere to reach deep ocean regions. Where ‘ indicates differentiation with respect to time, t. As indicated, all terms are functions of time, t. A, L, C, and F are the CO2 quantities in the atmosphere, land, ocean and fossil fuels, respectively. The time-dependent transfer rate from atmosphere to ocean is Ac; Ca is from ocean to atmosphere, etc. In the equations used the fossil-fuel equation is eliminated and fossil-fuel input is simply modeled as a constant input, F, to the atmosphere which results in the following difference equations to be solved numerically. The associated entries for each year n+1 in terms of the entries for year n follow as Equations 3. For year 0, the current values of the carbon content and transfer rates are used and the ocean region modeled is the 800-petagram (pg) shallow ocean. The difference equations for the biosphere modeled as the atmosphere, land and four equal segments of the shallow ocean are listed below. Table 1 shows the results of this integration for ten years at a uniform rate of 10 pg/year and Figure 10 graphs the results of for expanding into all regions in which the CO2 is allowed to escape. Fractional increase is the ratio of CO2 content to that at time-0 minus one, and is plotted as the ordinate of the CO2-content curves because it displays the proper perspective of increases as positive and decreases as negative. The escape of CO2 into these regions cannot actually be restricted as indicated, but the modeling of it illustrates the relative importance of the various regions in atmospheric CO2 removal. Figure 10 implies that the slow rate of transfer into the ocean does not allow a sufficiently rapid escape of CO2 from the atmosphere below about 12 % of the ocean’s initial carbon content to affect (decrease) the maximum level in the atmosphere until after the input to the atmosphere ceases. The huge capacity of the deep ocean contributes almost nothing to the limitation of the atmosphere’s maximum level. In Figure 10 the atmosphere and its combination with the first three levels below it are small enough in capacity that its maximum level achieved is minimally dependent on either the rate of its CO2 input or the number of segments modeled in the receiving volume. But with greater depths of ocean included, CO2 has to travel distances that are far enough removed from the atmosphere that its removal is impeded not by presence of an artificial barrier but by the rate which CO2 can travel through the ocean thereby impeding its rate of escape. The size of time increments and segments modeled both can both influence carbon transit before the barriers are effective. Restriction to the atmosphere, only, allows no removal, of course. The ocean regions are all modeled with 200 pg segments. 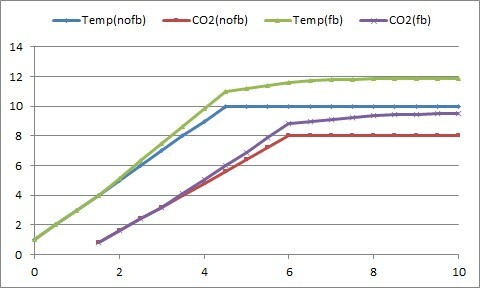 Figure 11 shows the temperature effects associated with carbon levels of Figure 10. The slow rate of ocean travel explains why the maximum level in the atmosphere is constant from about 15-to-100 percent of the total ocean being included in the receiving volume. Once the input to the atmosphere ceases, the greater ocean volumes eventually remove increasingly more CO2 from the atmosphere and the ultimate fractional increase is only 0.23 with the total ocean involved versus the 12.2 there would be if there was no removal. As indicated in Figures 12 through 17, the time required is several millennia. Figure 11 shows the temperature increases associated with the carbon levels of Figure 10. All these are hypothetical except for the final one, the land plus the entire ocean, because the regions cannot be physically excluded from receiving atmospheric carbon. Table 2 summarizes temperature results from the CO2 levels plotted in Figure 11. Comparison of Figures 12 and 13 illustrates the small difference in maximum atmospheric level achieved when modeled with and without an artificial barrier at its lower extremity. * A is for atmosphere, L for land and the number is percent of ocean. ** When the biosphere reaches equilibrium following CO2 cessation. The difference totally disappears beyond the 12% fraction of ocean involvement and the maximum fractional increase in the atmosphere never drops below 1.57 with this model as shown by the overlaying of these plots. Figure 14 shows the results of limiting the receiving volume of the ocean to 25%. Figure 15 shows the distribution for limiting down to the top 50% of the ocean. Figure 16 show representative levels with the entire ocean included the biosphere receiving volume. Figure 17 provides added perspective that may be obscured with 204 separate plots. “Ocean 10” in the legend refers to the 10th ocean segment below the surface, etc. There are 204 such segments of 200-pg of initial carbon each in the total ocean. The fact that modeling 25%, 50% and 100% of the ocean as part of the receiving biosphere produces identical maximum fractional increase in atmospheric level indicates that only the upper regions of the ocean contribute to draining the excess CO2 from the atmosphere in times less than 1000 years (while CO2 is still being inserted in the atmosphere). In fact, some of the lower segments of the ocean are unaffected by atmospheric increases for 2000 years after the start of atmospheric input (0 time) and 1000 years after the atmospheric level is modeled as having reached its maximum. The curve labeled “all biosphere” matches the ratio of inserted carbon to total initial biosphere carbon. It is, of course, linear with time and reaches a constant maximum value in 1000 years, the assumed duration of carbon insertion. The all-biosphere maximum is inversely proportional to the total biosphere modeled and all segments match that (constant) value for their ultimate fractional increase. For the total world fossil carbon reserves (10,000 pg) and the total biosphere carbon (43,620 pg) this fraction is 0.23. CO2. Any delay in response is obviously negligible. The claim that we can “lock in” a response for the future by currently adding CO2 is not valid. Figure 18 also demonstrates the effect of saturation because the disparity between relative CO2 increase and relative temperature increase is proportional to the increase in CO2. Appendix A shows typical world carbon balances from Reference 22. There are many of these in Reference 22 and they all show approximately 200 pg/year being exchanged between the atmosphere and its surroundings, about equally between the land and the ocean at 100 pg each. IPCC’s 4th assessment report notes that they are “estimates” without providing any more detail than that. Because of their wide acceptance, the approximate average of these exchange rates was chosen for this analysis. However, the atmospheric loss rate of carbon-14 from the atmosphere that was deposited there by the atmospheric bomb tests of the 1950’s and 1960’s indicates the relaxation time for carbon’s removal from the atmosphere is 14 years as indicated in Figure 19 from beyond 1970 (16), which would determine an exchange rate with its neighbors of approximately 50 pg/year. This much lower exchange rate delays the escape of CO2 from the atmosphere to the extent that the all-time maximum temperature increase is 1.32 C instead of 0.98 C, still lower than the minimum of the IPCC predicted temperature rise for this century, alone. Figure 20 compares the atmosphere temperature histories between the 50-pg/year and 200-pg/year exchange rate. A response from Kevin Trenberth, noted contributor to published IPCC reports, to the IPCC’s 21st-century over-prediction of temperature rise (see Figure 4) has been that the deep ocean has started storing additional heat and that the extra heat “will come back to haunt us sooner or later” (17). The problem with that conjecture is that it violates the fundamental laws of thermodynamics. The heat to the ocean comes from above, and extra heat cannot be transferred downward without increasing the temperature gradient between the surface and the deep layers. Any such increase will decrease the lower temperature relative to the upper temperature, contrary to the Trenberth hypothesis. The temperature dependence of water density gives a boost to thermodynamics in this refutation. Warm water rises and cool water sinks. Trenberth’s hypothesis cannot be valid. *Limit basis for the results of this analysis. Table 4 values are the summary values from the results of the latest IPCC Report, AR5 (18). It contains the statement that most predictions fall between 1.5 and 4 degrees Celsius temperature rise for the 21st century and this is the basis for comparison. The report also refers the results back to “the period between 1850 and 1900” without specifying a CO2 level or temperature of that period. Neither the CO2 levels nor temperature levels for that period are well known. However, the CO2 levels and temperature estimations of that period do permit an approximate comparison. Therefore, the best comparison that can be made for 21st century temperature rise is an approximate one between two different approximations—the IPCC models and this one. There is a general consensus of a temperature rise of 0.7-0.8 deg. Celsius since 1850. Therefore the temperature records of Table 4 derived from the AR5 summary for policy makers, SPM (17), are reduced by 0.8 to compare with the temperature rise predicted here in Table 3 for the 21st century. Alternatively, the rise in temperature predicted by the method of this article in going from the 280 ppm of 1850 to 400 ppm used for the starting level for this study can be added to the values in Table 3 to compare with the value listed in AR5 from 1850. This value is 0.39. Another comparison is by extrapolating to the end of this century the results of Figure 4 of the IPCC predictions reported by Christy and Spencer and those by using the method of this study. The IPCC does not publish the results of studies such as those used by Christy and Spencer. These are presumed to be obtained from the analysts who produced them for the IPCC. The three different sets of comparison in Table 4 show that IPCC results exceed those of this study by factors ranging from 2.5 to 8.4. Recall that Table 3 which shows that all of the conservatively chosen CO2 reservoir levels and CO2 insertion rates predict all-time maximum levels that fall below the lowest IPCC prediction level (1.5 C) for just this century. A final metric of comparison is “climate sensitivity,” CS, defined both as the degrees Celsius of temperature increase from doubling atmospheric CO2 or as the increase per unit of forcing function, (w/m2)-1 (19). It is dependent on the level from which it is doubled as well as the climate conditions during its doubling. All IPCC reports have listed a range of values for it, which have been the same, from l.5 to 4.5 C, for doubling except for AR4 which raised the lower limit to 2, but that was again reduced to 1.5 C for AR 5. Because of its dependencies, listing a range is necessary, but the listed range is very high. However, none of the IPPC’s means of determination are able to isolate the heating due just to carbon dioxide so its utility seems very limited; and there is controversy over what time frame should be involved. 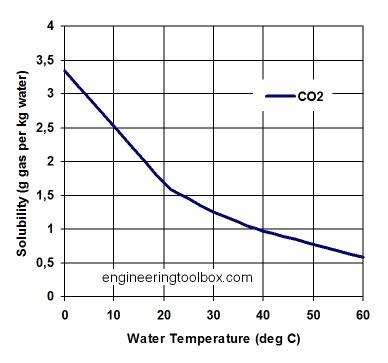 The only way to isolate the CO2 effect is to use a code like Modtran with Equation 2 at a given input CO2 and then doubling that keeping other conditions constant to get the temperature-rise difference between the two. Using a broad scope of choices of climate and weather conditions available in Modtran, no condition was found where it exceeded a value of 1.0 C (fifty percent lower than the lower limit of the ranges listed in the IPCC reports). The average is about 0.7. Reference 9 calculates a value of 1. Its only obvious use would appear to be as another means of exaggerating CO2 effect. Reference 20 indicates that human beings can function well at levels up to 5000 ppm of CO2 (12.5 times the current atmospheric level) without impairment and that this is a common level in submarines. The systemic effect above that level is caused by oxygen dilution. Reference 21 indicates optimum level for plants (most efficient photosynthesis) is 1000 ppm. A level as high as 1000 would seem desirable. As long as the level does not approach 5000, there should be no concern. APPENDIX A. ATMOSPHERIC CARBON CYCLES. The model choice for this analysis is that which maximizes both the carbon content in the atmosphere and fossil fuels as well as the rate of fossil-carbon input to the atmosphere which is that of Figure A3. MODTRAN (MODerate resolution atmospheric TRANsmission) is a computer program designed to model atmospheric propagation of electromagnetic radiation for the 100- 50,000 cm-1 (0.2 to 100 um) spectral range. The most recently released version of the code, MODTRAN5, provides a spectral resolution of 0.2 cm-1 using its 0.1 cm-1 band model algorithm. Some aspects of MODTRAN are patented by Spectral Sciences Inc. and the US Air Force, who have shared development responsibility for the code and related radiation transfer science collaboratively since 1987. The acronym MODTRAN was registered as a trademark of the US Government, represented by the US Air Force, in 2008. All MODTRAN code development and maintenance is currently performed by Spectral Sciences while the Air Force handles code validation and verification. Software sublicenses are issued by Spectral Sciences Inc., while single-user licenses are administered through Spectral Sciences’ distributor, Ontar Corporation. MODTRAN5 is written entirely in FORTRAN. It is operated using a formatted input file. Third parties, including Ontar, have developed graphical user interfaces to MODTRAN in order to facilitate user interaction and ease of use. MODTRAN is accessible to the public at http://forecast.uchicago.edu/Projects/Modtran.html. Where Iout is the infrared heat radiated outward from the earth at 70 km altitude. On the graph, the smooth lines represent perfect blackbody radiation at the temperatures cited in the legend on the graph. The red, jagged line is the earth’s actual infrared emission outward at 70 km altitude. The horizontal axis is in units of wavenumber, proportional to frequency and inversely proportional to wavelength. To convert wavenumbers to wavelength in microns, simply divide the wavenumber value into 10,000; i.e., 10,000 wavenumbers corresponds to a wavelength of 1 micron. The visible spectrum is from 0.8 to 0.4 microns. Please note that the result is for the tropical latitudes, no clouds or rain, with the instrument or observer looking down to the earth. To run simulations for the average earth, set “Locality” to “1976 U. S. Standard Atmosphere” and change “No clouds or rain” to “NOAA Cirrus Model (LOWTRAN 6 Model)”. When you simulate at these conditions, you will see that the ground temperature changes from 299.7K to 288.2K, corresponding to the 15C that is usually taken as earth’s average surface temperature. The radiation emitted from earth, Io is 242.782 w/m^2. To compare the heat loss from earth at various CO2 levels, use the 1976… and NOAA…. settings, leave all the rest the same, and set the CO2 ppm to 390, which is closer to the current amount. Record Io (watts/m^2) for that simulation. Then change increase the CO2 amount to whatever you choose. Doubling atmospheric CO2 would be 2 x 390 ppm = 780 ppm. When you double CO2 (780 ppm), you will see that the new Io (heat lost to atmosphere) drops to 240.336. Therefore, using Modtran, the heat loss from the earth by doubling CO2 is 242.782 – 240.336 = 2.446 w/m^2, which is the greenhouse effect of doubling CO2 (an estimate). To study (estimate) the effects of changes in other atmospheric constituents (CH4, Ozone & water vapor) at any given, constant CO2 ppm, do as follows: multiply the default quantities (17 ppm CH4, 28 ppb O3, water vapor scale) by the 1 + the amount you want to change them. If you want a 20% increase, multiply by 1.2. Modtran gives a good, but not the best estimate of radiative heat loss. Other programs, like SpectralCalcTM should give more accurate estimates. Modtran averages over the entire earth over an entire year. 4. Dr. Roy Spencer, Global Warming Home/Blog. Global Warming Slowdown: The View from Space, April 16, 2013.
http://data.giss.nasa.gov/gistemp/tabledata_v3/GLB.Ts+dSST.txt; linearized by C. Bruce Richardson. 9. Stephen E. Schwartz, “Heat Capacity, Time Constant and Sensitivity of Earth’s Climate System,” Brookhaven National Laboratory, June, 2007. 12. The International Satellite Cloud Climatology Project and University of East Anglia‘s Climatic Research Unit. Last cloud data used: December 2009. Last figure update: 4 September 2011. 17. Kevin Trenberth and John Fasullo, Title: “Tracking Earth’s Energy,” Science, April 16, 2010. The author gratefully acknowledges the following contributions to this effort. To Neil Brown for much encouragement and for useful reviews of several drafts of the document. To Ed Berry for early advice and encouragement and for posting prior versions on his website for comments. To William Happer for a critical review of the previous draft, for helpful suggestions, for encouragement and for lucid explanation of the physical processes involved. Bryce Johnson is retired professional nuclear engineer in the state of California with a 45-year career in nuclear-reactor and nuclear-weapons research. His education includes BS (ME), University of Idaho; MS (NE), North Carolina State University and PhD (ME), Stanford University. June 16, 2014 in Carbon dioxide, feedbacks. Wow, what a post. I noticed the name William Happer in the credits. Just WOW!!! This is a Magnum Opus. Many thanks to Bryce Johnson for the insights, mathematics and explanations. This needs an accurate press release that journalists can understand. Then the journos need to persuade their MSM owners to allow them to report it without spin. Regrettably I don’t think this will happen. An awful lot of work proving nothing. It all relies on the working of a non validated theory, a theory that violates the laws of thermodynamics amongst others. Water provides the feedbacks needed, with phase changes using latent heat, and cloud variation changing albedo to suite required input energy. Another climateer problem is the fascination with radiation as the major heat loss process from the surface. It is not, conduction and convection are, interlinked with latent heat use. Interesting attempt, only a few notes. The Ocean heat content, I refer here to the Humboldt stream. Trenberth statement is plausible. Another point is that the surface temperature of the oceans in the tropics are close to their possible maximum, further increase will be limited by more low cloud formation. Great paper. Thanks for writing it. Sometimes the best way to argue a point with someone (IPCC) is to throw their own argument back at them. Rightly so, I created the above phrase to validate existence of so many natural ‘coincidences’. Thankyou for your very fine essay. It is important, cogent and a good reference. I make two minor points. First, the IPCC is the Intergovernmental (n.b. not International) Panel on Climate Change. This nit needs to be picked because it enables red-herring distraction from your points. The underlying reason for this is the high degree of uncertainty in the little existing data on the carbon cycle. And your Figure A3 (from Woods Hole) makes this clear. As I pointed out at the Heartland 1 Conference, that diagram shows almost all the carbon flowing in the carbon cycle is in the deep ocean but the ‘wiggley lines’ in the diagram show the carbon flows to and from the deep ocean are not known and those flows are so not understood that they cannot be estimated. Despite this, I strongly support the conclusions you draw from your carbon cycle considerations (but anticipate Ferdinand having a different view). Again, thankyou for your good article which I enjoyed. Perhaps unjustly, I based my judgment of whether to invest the time required to read this rather long post on the early passage, “If f is negative the output oscillates.” I read no more. What a great title for a blog. Some years ago I was doing a web page as part fulfillment of the requirements for an M.S. in Éarth science. I had not problem finding an example to explain negative feedback. But finding an example of positive feedback in nature is next to impossible. If you think about it, negative feedback is the modern way to state the Equilibrium Principle of Le Chatelier. Roughly, “Any change in status quo prompts an opposing reaction in the responding system”. This principle is not a law of Nature but an empirical generalization, but it is such a well-established fact of Nature that anyone who set up a null hypothesis should do so with the equilibrium principle in mind. To disprove the null hypothesis we might consider disproving that negative feedback is not present in a natural system. In other words we have to show that a natural system is not in equilibrium. “If f is negative the output oscillates.” I read no more. I twitched a bit on that too, but I’ll persist. It looking interesting. You compare electrical systems feedback to climate feedback. When a feedback is introduced electronically the power consumption of the system goes up. Can you tell me where the climate feedback gets this extra energy from? As I assume that 100% of solar energy will get used by the system, where will it get the extra percentages from? The issue of climate change is a non event. Temperature increase with no feedback is around 1.5 deg C.for a doubling of CO2. The historical record shows that an earth 1 0r 2 degrees warmer than current temperatures to be an improvement. I sympathise Joe, but I made the mistake of persisting. For the feedback loop to make sense you need to have the same units going in as coming out. Then followed a long ramble of mostly unsupported or inadequately referenced assertions (where does Figure 7 come from for example?). In a long article like this, where you are having difficulty making a point (except with the gullible), why diverge to mention climategate and include a primer for MODTRAN? There may be some good stuff here, but it needs to be sorted from chaff. Bryce, as regards MODTRAN, it is important to realise that it does not include feedbacks and consequently any forcings or temperatures it calculates are for the non-feedback case. Saying “no condition was found where it exceeded a value of 1.0 C (fifty percent lower than the lower limit of the ranges listed in the IPCC reports)” indicates that you don’t understand this. Even in the non-feedback case, when MODTRAN calculates a forcing of 2.446 w/m^2 and you say it is the greenhouse effect of doubling CO2 you should suspect why this is in not in accord with the IPPC’s often quoted figure 3.7 W/m^2 for the non-feedback case. Question: Do you know what you did wrong as regards MODTRAN? More simply, were average temperature subject to an unopposed positive feedback loop, we would have had a runaway warming at any of the previous warm periods and we would not be here. Previous warm periods have been warm enough and long enough that were any of the feared ‘tipping points’ real, they would have been triggered. The fact that we are alive and cool periods like the Little Ice Age are recorded reality tells us without breaking out a calculator that either there is no positive feedback to temperature or there is an opposing negative feedback that overwhelms it. Gösta Pettersson has withdrawn those papers from the web site he set up to diffuse them because he has recognised there were important errors. He said early this years ( personal communication ) that he was intending to rewrite them . AFAIK, not news on that. While there was some good analysis in those papers it is not appropriate to quote them when the author regards them as incorrect and has withdrawn them. It’s odd that you do not link to his papers if you want to use them as a reference. You don’t even give a link to the WUWT article, the reader is supposed to fish it out. No, it’s awkward but correct. He’s looking at feedback as the sum of orig + part fed back + feedback of feedback etc – a geometric progression. It’s the partial sums of that series that oscillate. Epic takedown and deconstruction of the “carbon” scare. And yet, this work aligns with the real world. The IPCC does not. Global warming has been around 0.7ºC over the past 150 years. That is nothing; it is a small fluctuation in the planet’s recovery from the Little Ice Age. Further, for the time being at least, global warming has stopped. None of the climate alarmist crowd’s scary predictions have come true. Not a single one, from ocean “acidification”, to increased extreme weather events, to accelerating sea level rise, to a giant methane burp, to vansihing Arctic ice, to disappearing Polar bears, to runaway global warming itself. And of course, there is no measurable, testable proof of AGW. All those things are assertions, with no verifiable empirical evidence for support. When one side has been flat wrong about everything, rational people will stop believing them. That is what is happening. The public is weary of the never-ending cries of “Wolf! !” If it were not for the grant money and self-serving UN kleptocrats, the climate debate would be a minor backwater in science. Figure 7, just by eye seems to get the fitted slope too low. This is classic mistake ( endemic in climate science and further a field ) that is caused by using linear regression on data with significant error in the controlled variable ( or more accurately not having a controlled variable ! ). Yes, too many holes in this for me to bother wading any further into it. I am only slightly reassured by the fact he is now retired. But positive climate feedback DOES exist. Ice ages are the result of albedo positive-feedback-loop amplification. However I agree with the author that feedback outside of albedo one at the peak of the ice ages warming phase must be negative and must be strongly negative. It’s the only way to explain the extremely flat and stable ‘top’. There’s one thing that is misleading, both when the IPCC says that there is a positive feedback, and when we say that this is impossible because otherwise we would enter runaway warming scenarios. Yes, it is true that any electric circuit with a positive feedback is unstable, stability is brought by negative feedbacks, and therefore, given that our climate has never got into runaway scenarios, it is stable and the feedback has to be negative. But when the IPCC talks about positive feedback, it is not talking about the overall feedback of the circuit, but just the feedback of one small part of it. The overall feedback will always be negative because emisivity grows as the fourth power of the temperature, which means that once temperature gows up a little bit, the Earth cools faster. This is what prevents runaway scenarios, the final part of the loopback which will make the overall feedback always negative. This is NOT incompatible with other parts of this loopback having a positive amplification, like the effect of CO2. This positive amplification causes the overall feedback to still be negative, just a little less negative than otherwise. And this means that the circuit is still stable, but you need a higher temperature for the Earth to cool fast enough to counter the effect of the increased GHGs. So it is true that Nature abhors positive feedbacks… overall. But nobody is suggesting the possibility of an overall positive feedback. The overall feedback will always be negative. Even Venus’ temperature is stable, proving this point. But the overall feedback being negative doesn’t mean that all of the components of the feedback loop have to be negative. It is the sum of them that will be negative. If some component with a positive feedback increases, some other providing a negative feedback will counter that. Still, temperature may have to go higher to reach a new equilibrium than it would need without that small component in the loop that has a positive feedback. Notice that I don’t support the claim that the positive feedbacks claimed by IPCC actually exist, I’m just saying that it would be entirely possible for them to exist and still the Earth’s climate to have an overall negative feedback and be stable. The analogy with an electronic circuit is not valid because the GHGs feedback is only one small part of the loop, the one of the downwelling radiation, and it is not a problem if downwelling radiation increases with temperature with a positive feedback, as long as the upwelling radiation increases even faster. The link to the MODTRAN interface is nice. Dr David Archer provided something similar years ago, including an exercise for students demonstrating that cutting CO2 emmisions would virtually zero impact. He has since removed it and apparently got told to “get with the program”. But positive climate feedback DOES exist. Despite some rather ill-informed comments by others, no one in climate science is disputing that the over-all feedback is negative. That much is obvious. Neither is there much dispute that some feedbacks will be positive. The question is to what extent other +ve and -ve feedbacks alter the main Plank feedback, ie just how negative the end result is, not whether it’s negative or not. Lindzen explained it rather well in his EIKE lecture featured here on WUWT, a couple of days ago. Without regard to anything else in the post, this one assessment of the IPCC holds the key to why we are where we are today. Real science has be subverted for political and economic gains. Joe Bastardi says:	Have I ever told you you’re my hero ..
What causes you to sing his praise so strongly? Was that an opinion formed on the basis of this article or do you already know Bryce Johnson and your comment relates to other work he’s done? Solid and thorough. Well documented. It is straightforward physics that make most of us with no financial stake in the alarmism industry reject the notion that CO2 matters and warm is bad. (Cold kills. Warmer is better.) Besides, the author is a nuclear engineer. What? Seriously? You really didn’t understand it. This would make your 666 1/cm wavenumber to 666 nm instead of the correct 15 µm. No it doesn’t. Negative feedback reduces system gain; the output decreases relative to input. Net power consumption is reduced or, at most, unchanged. Anything dominated by possitive feedbacks is a thing of the past! ;) Even though positive feedbacks are one of the more laughable claims out there, they seem to get the least flack. Thanks for the post. This postie is right, where does the extra engergy come from? Oh, please, it’s block diagram, you don’t need a circuit. Just model the feedback by numbers, it’s pure maths. The “power supply” is the big yellow ball men have worshipped since they discovered the need to worship things. There’s plenty of incoming power, what is causing all the excitement is an overheated discussion about a couple of W/m^2 more or less of what is lost to space. In the very nearly stable conditions of the Earth system there’s 342 in, 342 out , plus or minus …..
There’s potentially 342 W/m^2 more available before “power supply failure ” provides the ultimate negative feedback. It seems to me that the demonstrable fact that the earth has not long since either burned to a crisp or permanently frozen solid should prove to even the most casual observer that atmospheric system feedback to ANY temperature forcing function is “negative”. That’s where I started with AGW theory 15 years ago and its where I’m still stuck today. Mother Nature cannot possibly be the foolish lady AGW proponents suppose. The title of this post is correct. As an engineer, negative feedback rules in physics & positive feedback is rare and requires unusual or engineered conditions to dominate. I have no idea what either of you are trying to say. I find the title a bit tendentious. We wouldn’t exist in a nature that abhorred a positive feedback, nor would any form of life. Our hearts beat because of positive feedbacks. We digest food, go to sleep and wake up, divide and grow, ovulate, mate, and give birth — all due to positive feedbacks. All manner of switching and energy conversion requires a positive feedback. Very interesting article. Thank you. I do have a semantic quarrel over the phrase “clouds increase heat in the atmosphere.” The term “heat” in your phrasing is technically correct, but can mislead in the area of energy budgeting. Clouds never add energy to the atmosphere, they only play a zero sum role in mixing it and moving it around. But clouds always reduce the amount of incoming UV energy (during daylight hours), so they’re always a negative feedback. It’s one thing to disagree and to give your reasons for that disagreement but something else to admit you did not even read the piece and then to provide a snarky line like that. Here’s a flash, if that’s the depth of your analysis, we can do without it. Outstanding, well thought out, and excellent presentation……..
There’s the distinct possibility climate science has it’s positive and negative feedbacks reversed…. This is a good start for a professional engineering quality audit of climate science and various claims. Gene: I don’t think positive feedback means what you think it means. For anyone who works in electrical engineering / control systems, it’s intuitive that systems with positive feedback tend to blow up or reach the physical saturation limits of materials when allowed to develop over time. Your examples have more to do with organic systems, but there are a net negative feedback for all of the systems. Take heartbeats in your example above. Homeostatic systems in your body are all negative feedback systems. In this case variations in blood pressure and requirements for oxygen will change the rate of your heartbeat and diameters of blood vessels which will reach equilibrium and stabilize with each input to a ‘normal’ range. If these feedbacks were positive, your blood pressure would reach a ‘tipping point’ and go to infinity and your arteries would explode. Since they don’t, they’re a negative feedback system. I understand your point; I had recognized it when I read it in the post. But I don’t think that the physical world adds alternating positive and negative quantities in discrete steps like that. According to what people who I think know this stuff have told me, the author would be “correct” only if (1) the physical world were a discrete-time system or (2) the author is taking into account phase shifts he had not yet mentioned at that point. Joe Born, you may have been hasty not to read further. The author used an electrical circuit analogy to explain negative feedback. The oscillation he referred to results from whatever capacitance exists in the circuit as the result of a step or pulse input. Similar transient energy storage mechanisms do exist in the atmosphere so fundamentally there will be a damped oscillation though it might be hidden in the noise of the system. From our perspective the injection of CO2 is a smoothly rising input but from a whole earth point of view it is a step function. Where is the elevator speech version? When will you release the pdf? Paradoxically, Nature loves positive feedbacks for the purpose of achieving homeostasis. In order to make negative feedbacks really vigorous, Nature builds negative feedbacks out of positive feedback subunits. The clotting cascade is one of many examples from medicine. In climate, a thunderstorm begins when a small parcel of warm, moist air rises and expands, where it cools, some of the vapor condenses, making it lighter, so it rises faster, making it cool faster, making more vapor condense, making it rise faster, and so on. The cloud explodes upwards until the thunderhead runs out of troposphere, or out of moisture. Driven by positive feedback, the thunderstorm provides powerful negative feedback for solar heating. Sometimes, rapid overcompensation, driven by positive feedback, is how a system becomes not just robust, but anti-fragile. The long-lasting effect of the perturbation is to make the system more resistant to the next perturbation. Uncontrolled positive feedback does what you describe. But electrical oscillators require some positive feedback in order to run continuously. Like a clock pendulum requires a little “push” each cycle to keep going. Likewise, I expect a heartbeat has a positive feedback somewhere in the loop. True, my post should have been more accurate. When a negative feedback exists energy consumption is lower, when a positive exist the energy consumption is higher. Now, how in the climate can we either consume less of the sun’s energy and how can we consume more then 100% of what reaches earth? Nature realized that she can’t get rid of positive feedbacks, so she domesticated them, and put them in service of an overriding negative feedback. This report is similar to what the “Right Climate Stuff Team” said in their report. If all the fossil fuels were burned it would raise the temperature of the planet between 1.0 and 1.2 degrees C.
My thoughts: In response to those talking about feedback somewhere inside the model causing major and minor ice outbreaks (IE “ice ages” and the LIA), I believe those were more an issue of a change in the input, not a feedback. Solar insulation changes related to Milankovitch orbital mechanics certainly have the chops to change the equation substantially at the very beginning, IE input, stage. The LIA is dominated by impressive volcanic activity such that Solar insulation decreases, which again, is a change in input to the equation, not a feedback. Is this available as a pdf or doc? I tried to copy/paste it into a Word document, but I lost all the figures. Heat transfer is instantaneous, and is proportional to the difference in the two temperatures of the material touching each other, and the type of physical contact, and the area of contact. Long wave radiation transfer of thermal energy is also instantaneous: Proportional to the fourth power of the absolute temperatures, the emissivities of the surfaces facing each other, and the “shape factor” of those surfaces. (Heat “storage” and “measurement” (the change in temperature of matter AFTER that instantaneous heat transfer occurs is time-dependent. CO2 levels change markedly, regularly, and predictably through the year. Thus, IF CO2 were controlling temperature, then surface and mid-troposphere temperatures should change also during the yearly cycle by far more than they should be expected to change from year-to-year OR even decade to decade. Thus, what is the “correction” that we should see for the annual CO2 changes in the surface temperature record for that predictable CO2 changes/ And, if it is not there, then the annual temperature cycle should be very distinct for ALL temperature records after 1920. An August temperature record should be different “now” than it was in 1920, 1930, 1940, 1950 as the “August” CO2 levels changed from 1920 through 2015. A history of “May” temperature records should also change – but should be very different from the August trend over time, as should a early winter (low humidity, higher CO2 influence according to the dominant “arctic amplification” theory of CAGW. Could you provide links to the data used in making the figures? For example, Fig 4 shows UAH measuring twice the temperature rise of GISS. Is that correct? Code would be nice, too. by addressing contentious points expressed herein, one by one, followed by blogger reponses, etc. I was referring to energy in versus energy out im/balance in the context to the comments related to ice ages being evidence of various feedbacks. I was not addressing CO2. My comment was only in reference to the energy in part of the above equation. If energy in changes, you don’t need to rely on finding a feedback to explain ice ages or the LIA. It will already have been explained by the energy in part of the equation. To be clearer, in the ice age context it is the orbital wobbles that change solar surface insulation, in the LIA it is reflecting aerosals that change surface insolation. Both result in a change in energy if measured where it counts: at the surface. Otherwise, climate and weather have lots of feedbacks inbetween the “tipping” points of continued or large aerosol loading or orbital wobble, such as GHS’s and clouds (which are lumpy GHG’s in some instances). Secondly, one needs to move away from the completely outdated (19th Century) ‘confined space heating’ idea of CO2 warming. Even ‘climate science’ realised it doesn’t work in the real world already many decades ago. The basic (and necessary) premise behind this idea is that as the IR absorption ability of the lower tropospheric air mass grows stronger with an increase in CO2, there is no buoyant response, no convective change. We all know from everyday experience that this simply can’t and does not happen in the open atmosphere. Energy doesn’t accumulate down low. It is brought up. Automatically. It can happen in a closed glass box in a lab experiment. But that’s not the real earth system. The analogy fails. You can’t reduce the natural temperature gradient away from the solar-heated surface of the earth by simply letting the lower troposphere absorb more surface radiation. In this case, buoyancy wouldn’t simply constitute a partially offsetting negative feedback to CO2 warming. It would completely nullify it, pretty much instantly. ‘Climate science’ has of course come up with a more ‘clever’ explanation of how more CO2 in the atmosphere is allegedly supposed to make the surface warmer: The (in)famous ‘raising of the effective radiating level (ERL)’ hypothesis. Which strangely hinges on heating starting from a radiative imbalance aloft and propagating down the lapse rate ladder to end up on the surface. Utterly speculative, counter-logical, un-physical and totally unsupported by real-world evidence, of course. But still what all the warmists fall back on when they realise they can no longer push the ‘heating by back radiation’ nonsense on normal thinking people. IMO feedback is the third rail of CAGW, the monster into whose eyes one must not gaze lest one be unmade. It is where climate science should be focusing its attention and resources but cannot because to do so would be a top-of-the-lungs confession that the science is NOT settled, and because the risk is high—especially in light of the “pause”—that feedback research would propel the science in the “wrong” direction. Many commenters have already pointed out potential flaws in this paper. This is a good thing. My hope is that the tremendous resources of qualified, objective, and insightful WUWT commenters can be brought to bear to correct and improve this paper so that it becomes a challenge that can’t be ignored. Let Climate Armageddon be fought on the hill called Feedback. It consists of two pairs of identical resistors and capacitors plus a gain element. An op-amp with its gain set to 3.0 overcomes the attenuation created by the pairs of Rs and Cs. Giving a total loop gain of +1. It oscillates, any less that a gain of +1 and to oscillations die out, any more gain and the oscillations move from being a perfect sine wave to something like a square wave. Yes, parts of a system can have positive feedback (and lots of it) which can be balanced by attenuation or as some call it incorrectly, negative feedback. I did explain, I’ll try again. We can’t consume more than 100% of what hits the Earth, but the Earth could stop reflecting a lot of it straight back out ( cloud albedo etc ) and could change how much that is re-emitted gets out to space ( until the surface warms to restore the balance ). Since there is very little accumulation, energy in ~ energy out. that’s 342 W/m^2 being dumped. Any change in feedback has a massive power resource to draw on. That’s why there’s little point you and Eustace arguing whether it takes more or less with such and such feedback. 1. Has the process (Increasing atmospheric CO2) ever happened before? Yes, apparently many times over the 4+ billion years of Earth’s climate history. 2. Has the process ever resulted in runaway global warming? No, not ever. Conclusion: Negative feedbacks have always become dominant as the process tries to warm the atmosphere. ALWAY! As long as Earth has a vast supply of liquid water on it’s surface, the process cannot significantly warm the atmosphere. 3. Has the process always been associated with warming? No. Ice cores reveal that CO2 is still increasing when temperatures begin to cool towards a new ice age. There are periods in the Earth’s atmospheric history that appear to have much higher concentrations of atmospheric CO2 that are both somewhat warmer and much cooler than today. Conclusion: atmospheric CO2 is not the primary driver of atmospheric temperature. Over at least the last 5 million years, it appears that the hydrological cycle is controlling the concentration of CO2 in the atmosphere, not the other way around. The Earth begins to warm when CO2 levels are still decreasing. And the Earth begins to cool when CO2 levels are still increasing. It is still unknown what controls the hydrological cycle, but we do know that CO2 concentrations seem to have little impact. Mr. Johnson goes through a lot of effort to quantify the entire process, arriving at a value that agrees with the many others who have stuck with real world observations as the basis for their analysis. The only way to get a projection of a global warming crisis from increasing atmospheric CO2, is by assuming atmospheric processes that have never been observed in nature, and are contrary to the processes that we do observe. quite similar to the ~50 PgC/year calculated from the 14C decay rate. – The exchange with the deep oceans largely bypasses the ocean surface layer at the polar deep water formation and the more equatorial upwelling zones, each about 5% of the ocean surface. – The ocean surface layer is limited in uptake due to the Revelle/buffer factor: it follows the atmospheric changes with ~10% of the change. As the total carbon content of the ocean surface layer is ~1000 GtC, it increased with ~30 GtC for the 30% increase in the atmosphere. Its exchange rate is very fast: less than 1 year. I have to go back and read this several times but one thing that bothers me in all of these grahpics of CO2 balances is that plant intake and out put is always noted, but I have never seen the impact of other biota. I “assume” it is inherent in the ocean balance, but does anyone know what the impact of all the rest of the creatures on this planet have (or perhaps that is somehow included in the “land/soil” balance. As one who has had a 100 plus year history of ranching and living in the country, I have to think that all the biological processes out there have to had a big impact but maybe it is small compared to CO2 from fossil fuels. Yet, everywhere I look I see birds, animals, fish, breathing, excreting, dying and rotting along with vegetation. Is vegetation that much greater than other biota. Sorry for a non-scientific perhaps ignorant question, but I just have never seen a quantification. If it is so small as not to matter, then I should like to know that too. Lots to digest. Will take a while to read and read. I don’t have to spend an hour reading a very lengthy post and digesting every step of his model to have an opinion. At some stage when I see too many flaws I cut out and save my time for something else. When I see a professional nuclear engineer and nuclear researcher using OLS on a scatter plot and getting a visibly wrong regression result, it is not snark to say I feel slightly reassured that he’s retired. I add only because presumably much of his work is still in place. He really didn’t seem to understand what MODTRAN was about either and his “oscillation” comment was not generally true for the simple feedback example he gave. Knowing how to get the right slope off a graph is pretty basic requirement for both engineering and nuclear research. Not getting the feedbacks _exactly_ right and not knowing whether processes will oscillate or not are the kind of thing that are make or break issues in the nuclear industry, as Chernobyl demonstrated. A nice case of not mastering lags in the presence of positive feedbacks. When a reactor goes into operation it is called “going critical” and it’s not a humorous term. Here’s a flash. My comment stands, whether you like it or not. It was not snark. I’d be happy to see a concise argument that showed what he claimed to show and join in the fawning applause but oddly I’m just as critical of work showing results I would like see as those I don’t. Bryce: There seems to be some interesting ideas here, but I can’t tell much from what you have written. There is too much crammed into a single post and not enough organization. If you wish to continue pursuing this subject (which I would like to read about), I’d like to see you break it up into much smaller segments that clearly show where your analysis and the IPCC’s differs. For example, six thousand years of CO2 accumulation seems excessive: How do you and the IPCC differ over the next century or two? How well do you and they reproduce the observed accumulation over the past century? You choose a 10 pg/yr input of carbon; how does that compare with the IPCC. Then maybe I’d know what how to value your contribution. As I remember, earlier IPCC reports had some good information on the uncertainty with which emission of CO2 becomes accumulation of CO2 in the atmosphere. With AR5, emissions scenarios and the associated uncertainty in accumulation have disappeared and been replace by RCP’s – thereby hiding this uncertainty. The projected role of GHGs in warming and the projected decrease in aerosols in warming (highly uncertain) all gets hidden under one RCP tent, leaving the impression that it is all due to CO2. Gösta Pettersson has withdrawn those papers from the web site he set up to diffuse them because he has recognised there were important errors. can be downloaded from http://www.false-alarm.net as Paper 5. No news, but a sounder argumentation. And what he still forgets is that what comes out of the oceans has a different isotopic composition as what goes into the deep oceans: thus it is not only a matter of dilution by mass transfer but also a dilution by composition. But for the exchange rate with the deep oceans, the mass transfer rate still is usable. which shows that the biosphere as a whole is a small but growing source of oxygen, thus a small but growing sink for CO2. 2. Heat transfer out of the atmosphere is assumed to be limited to outer space. No credit is taken for heat transfer to the rest of the world (land and ocean) which actually occurs and cools the atmosphere because of its vast heat capacity. The assumption avoids complexity and the reliance on questionable parameters while assuring a conservative value of atmospheric temperature rise. So for rain falling from 5000 m (16,400 FT) you get a velocity of 313 m/s. But terminal velocity of rain 8 m/s and hail is around 43 m/s. Now those rock stars can “Get their money for nothing and their chicks for free” according to Dir Straits, but most engineers know Changing a masses velocity takes energy and friction is never free. So do the models leave most of the energy up in the air where is really is and what is the effect on surface temperatures? Same comment lost for a second time. Can you retrieve the last one? “Warm water rises and cool water sinks” This statement is TRUE but the implication that warm water cannot descend into the ocean is FALSE. Sea water is salty and so any net surface evaporation, such as occurs in the Mediterranean Sea, produces saltier and therefore denser warm water. If the salt concentration is high enough then the warm water will sink. This is why it is called thermohaline circulation. The warm dense westerly out flow into the Gulf of Cádiz, through the Straits of Gibraltar occurs BELOW the colder but less dense easterly surface inflow of Atlantic water into the Alboran Sea. Warm salt water can and does descend into the ocean. Here is a link to a Water Density Calculator which may also help. Notice from the chart that for salinity values above 25 psu the maximum density of cold salt water occurs at the freezing point. The chart clearly shows that for sea water with a constant salinity warm water is less dense than cold water so the expected rule “warm water above cold water below” holds in this situation. However the ocean is not a closed system it is an open system in which both heat exchange and fluid exchange occur at the surface. In the tropics, under the influence of the clear skies and dry down welling air of the Hadley Cell, the water of the ocean surface is warmed by sunlight and the water salinity is also increased by net surface evaporation into the atmosphere. Consequently warm dense surface water is created. This warm surface water can, as the chart shows, be denser than the colder less saline water from which it was created. Consequently it is perfectly possible in places where the surface water density increase cause by salinity increase exceeds the density decrease cause by solar energy warming, that warm dense sea water can descend into the ocean. The following link to the Virtual Seismic Atlas shows the seismic response of the warm dense Mediterranean Bottom Water as it exits west through the Gibraltar Strait and flows beneath the colder surface water of the open Atlantic. The profile shows a cross-section though an anti-cyclonic eddy of warm, saline Mediterranean water formed in cooler, fresher North Atlantic water in the Gulf of Cádiz to the south of Cape St. Vincent, a so-called “Meddy”. The reflections are largely determined by the short wavelength changes in temperature with depth. The strong reflectivity over the top of the Meddy is formed by alternating layers of water (intrusions), whereas the weaker reflectivity at the base of the reflectivity both inside and outside the meddy are caused by double-diffusion effects (staircases). Although I agree with the article’s general conclusions, I must say that to me the schematic does not seem a very accurate representation of the basic greenhouse model of global warming that is used by the IPCC. There the “input” is incoming shortwave solar energy that is absorbed at the surface, the “output” is outgoing longwave surface radiance and the “feedback” is provided by the greenhouse effect from CO2 and other “greenhouse gases” in the atmosphere. CO2 is thus not the primary input in the IPCC’s greenhouse model as it is in the author’s schematic. The fact that the greenhouse effect is conceived as a positive feedback mechanism in its own right appears to have gone largely unnoticed in the public discourse on global warming. However, it has significant implications about the behaviour of the greenhouse effect that render it amenable to empirical validation or refutation. For example, since the effect of a positive feedback is always to amplify any changes in the magnitude of the input variable the greenhouse effect should amplify any surface temperature variations that arise from variations in primary solar input according to the strength of the greenhouse effect. Hence any global surface warming that occurs due to an increase in the strength of the greenhouse effect (due to an increase in the quantities of greenhouse gases like CO2 in the atmosphere) should be accompanied by a corresponding increase in the sizes of actual surface temperature variations and these should be observable in the historical surface temperature records (if the records are accurate). But to date they are not and this fact means that either the historical surface temperature records (such as HadCRUT4) are woefully inaccurate or else the modern phenomenon of global warming has not been caused by an increase in the strength of the greenhouse effect. How far? if the mechanism for warm water sinking is evaporation at the surface boundary, I would think that after sinking only a small distance the salinity and temperature would re-balance itself by mixing with the water beneath the surface, so that this process would be mostly limited to a relatively thin layer near the surface of the ocean. Or at least you would expect that the rate of descent would be such that it slows dramatically after the first 20-30 meters so that any substantial intermixing of surface seawater with that at depths of say a quarter of a mile would occur on millennial time scales. The reason I bring this up relates to the claims that global warming will cause the sea levels to rise by thermal expansion. I have a hard enough time believing that heat transfer from air (low heat capacity) to saltwater (high heat capacity) will cause enough of a temperature rise in the water to result in noticeable expansion – particularly given the difference in mass between air and water. The usual party line I hear is that there is so much water in the ocean that even very small changes in temperature can cause several feet of seal level rise, but if the thermal transfer of heat from the air to the oceans is limited to a thin boundary at the surface, then most of the water in the ocean will not be expanding. Even assuming a spherical earth with water all the way around, so that expansion in all three dimensions is reflected in expansion only in the vertical direction, you would still have to heat the air much more than 1 degree C to get say a 0.1 degree C increase in the temperature of sea water to any meaningful depth, particularly given that you have no way of mixing the heated air with the water but have to rely solely upon radiative transfer across a highly reflective surface and a very slow process of transferring that heat downwards into the water. Whatever heat is transferred to the boundary layer of the ocean may well be given right back to the atmosphere by evaporation before any significant sinking occurs. I’m not sure it would be possible to design a more Inefficient heat transfer system. The analogy of climate system with electrical circuits is inappropriate. There is no real positive feedback in the climate system. All climate scientists, deniers and warmists alike, agree with this whether they realize it or not. The fact that climate sensitivity to CO2 is logarithmic is already proof that negative feedback is in effect. Note that you need greater input (CO2) to attain the same effect (temperature change). It’s a diminishing return. A negative feedback. The real debate is how strong is this negative feedback. However, the language of climate science confuses this issue because negative feedback is defined as greater than 3.3 W/m^2 TOA outgoing radiation per 1 K change in surface temperature. And positive feedback is defined as less than 3.3 W/m^2/K. So we talk of positive and negative feedbacks when it is really just negative feedback strictly speaking. To make your work comparable to the works of climate scientists, what’s your calculated change in surface temperature per doubling of atmospheric CO2? BTW even the “runaway greenhouse effect” in Venus has negative feedback. It is in thermodynamic equilibrium at 460 C surface temperature. If Venus had positive feedback, it will be vaporized and we’ll be seeing a gaseous giant rather than a rocky planet. Oh you got 1 C as upper limit to doubling of CO2. That’s almost the same as the “no feedback” TCR. Good question. Have a look again at the Meddy diagram, that clearly shows mixing as the Mediterranean Bottom Water (MBW) descends into the Atlantic abyssal depths. The warm dense MBW does not reach the deep Atlantic, but it obviously descends and is a significant contributor to the oxygen-poor water layer found in the Atlantic at mid-ocean depths. Please note that I am not here to praise Caesar, merely to bury him. MODTRAN does not calculate or include feedbacks, but the change in forcing functions calculated by successive applications of MODTRAN allow one to calculate feedback, and it is always negative for increases in either CO2 or H2O. Positive feedback is what you have when you balance an orange atop a bowling ball – the slightest breeze will disturb the system, setting it into irreversible motion. Negative feedback is what you have when you balance a bowling ball atop an orange – the pulp from the orange will keep the bowling ball centered and give it more resistance to change. Now this article agrees quite well with what one would expect. As the earth almost assuredly has negative feedback systems built in or we would have never been alive to ponder it in the first place. Very well written and logical, and it agrees with what almost HAS to be the case if intelligent life was to live long enough to evolve. Joe is correct, the output does not oscillate. Nick Stokes correctly interpreted what I was trying to say. I was attempting indicate that the successive terms in the infinite sum which characterized the output caused the partial sums to oscillate. But the output is not determined until the sum settles down (asymptotically) to a constant value when the number of terms become large enough. I apologize for the careless statement. “World temperature”? Of what? Surface temps, air temps? Winston says: “World temperature”? Of what? Surface temps, air temps? Greg Goodman: must you personally attack authors? What ails here is this salient fact humans cannot accept: the planet’s climate is NOT stable at all. No way, it has these sudden, violent shifts from hot to cold with cold predominating by about 80% more than warm. The riddle of the Ice Ages still is poorly understood. What is understood least of all is why each Ice Age suddenly and quite violently ended with the warmest temperatures being during the initial melt. There are many claims and theories but none have been able to overcome the problem of this being a repeated cycle and the sudden flip from one extreme to the other. 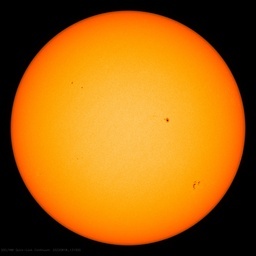 My belief is, the sun is doing this, seemingly trivial changes in solar power translates into a climate flip and CO2 has virtually nothing to do with any of this any more than O2. The analogy of climate system with electrical circuits is inappropriate. The feedback picture is NOT an electrical circuit. It’s simply a block diagram, and it’s appropriate. People are misunderstanding the block diagram. Let’s define the blocks such that the concept is easiest. INPUT is massive amounts of energy from the sun. PROCESS is the system that warms/cools the earth. OUTPUT is the average temperature of the earth. Now, CAGW believers claim that the feedback is positive. This means that they are claiming that a higher OUTPUT (a warmer average earth temperature) is causing additional warming inside the PROCESS. This causes an even higher OUTPUT (an even warmer average earth temperature). This even higher OUTPUT causes additional warming inside the PROCESS. So, the existence of positive feedback implies runaway global warming despite the fact that the OUTPUT (the average earth temperature) is within natural variability ranges. Here’s the problem with this thinking. The feedback doesn’t care if the increased OUTPUT is natural or human-induced. Any increased OUTPUT would cause runaway global warming. So, why hasn’t it happened prior? No, this is not always the case. INPUT (electrical power) can be constant despite a dynamic OUTPUT. For example, a PROCESS could initially be dissipating most of the INPUT power. A positive feedback might simply cause the PROCESS to dissipate less power. This means that increased OUTPUT would allow more INPUT power to be conveyed to the OUTPUT. In the global temperature model, the power from the sun can be constant. A change in the process prevents less cooling (dissipation of the sun’s power). This would cause greater warming. The model is appropriate. The IPCC “science” relies on ASSUMING a positive feedback relationship between global temperature and CO2. There is, in fact, no valid evidence to support the assumption. Therefore, their computer modelling exaggerates the influence of CO2. In practice, it is seen to be invalid because the accepted computed average global temperature is far less than they predicted. Fairly straightforward clear-thinking process, one would assume. I have two comments on MODTRAN: One is that it does not have the carbon dioxide absorption spectrum modelled in full detail, such as pressure broadening of fine scale elements of absorption element clusters. Even Dr. Roy Spencer seems to go with a 2x change of CO2 causing a 1.1 degree change in global temperature, without added negative or positive feedbacks. Another comment I have is that screen captures shown have water vapor being held as “pressure”, which means constant partial pressure, or constant percentage of the atmosphere, as the world warms. The other option is “relative humidity”. Using “pressure” artifically considers the water vapor feedback to be zero. 1: The saturation effect of CO2 absorption is already accounted for. CO2’s effect is not considered a linear one, but a logarhythmic one. Even the skeptical Dr. Roy Spencer has gone along with the IPCC-considered figures for direct effect of CO2, and argued instead about feedbacks. 2: There is a water vapor positive feedback. 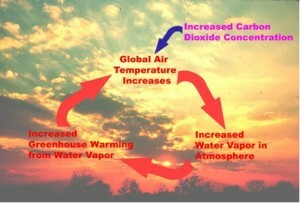 Water vapor is a greenhouse gas, and there is more of it in the troposphere when the world’s water surfaces are warmer. 3: There is a way the cloud albedo feedback can be positive. Dr. Roy Spencer seems to think that one is negative, but seems unsure. I think it’s positive, but only a fraction as positive as said by scientists that IPCC considered. I am aware of a cloud albedo feeback positivity mechanism, but it reduces the amount of positivity of the water vapor feedback. As an oversimplification, I think it is close enough to consider the water vapor feedback as if constant relative humidity is a valid assumption, and cloud albedo feedback as zero. 4: Two feedbacks to consider are the lapse rate one and the surface albedo one. The lapse rate feedback is a negative one that gets more negative with warmer surface temperatures and/or more greenhouse gases, and vice versa. The surface albedo one is a positive one, and it gets more positive when global temperature favors a given small amount of radiative forcing resulting in a larger change of snow/ice cover where it matters for radiation balance. The surface albedo feedback is zero in the case of a “snowball earth” and an “ice-free earth”. It has probably been most positive during transition times between high-glaciation times and low-glaciation times. One thing I see is that the lapse rate feedback is more negative when it is a feedback on both an independent greenhouse gas change and on the temperature change that the greenhouse gas causes, as opposed to the temperature change alone. I suspect this matter did not get considered by IPCC or most of the scientists considered by IPCC. Overall, I think the feedbacks are much less positive than IPCC considers them to be, and will become further less positive, maybe eventually negative, as the world warms. However, one thing I would like to caution, is that persons, entities, or camps caught overstating their cases will lose their credibility. The credibility loss will be greater for those who “stay their course”. I fear that both sides of the AGW debate are largely divided into extremist camps. When AB > 1, the system is unstable, so does not have a well-defined gain; the gain may be called infinite. Ferdinand Engelbeen, a diminishing positive feedback doesn’t make sense or any reason other than preventing the silly run-away scenario. If water vapor increases, clouds decrease, methane escapes, reflective polar ice melts, etc. then there’s no way that positive feedbacks would diminish. Additionally, there can be no data to support such a claim. In other words, your graphs are merely claiming that feedback is positive until it isn’t. It might be safe to say that any earth processes that contain a positive feedback characteristic over the long term have long since been crushed from existence by that characteristic. Such processes contain within their seed the energy of self-destruction, and so they do. They necessarily evolve to other stable processes or vanish. It is difficult to think of the Earth’s climate as both stable over billions of years and also vulnerable to positive feedback. One or the other should have long ago tipped the scale. Ferdinand Engelbeen, a diminishing positive feedback doesn’t make sense or any reason other than preventing the silly run-away scenario. Sorry, but that is what I learned in process chemistry some 50 years ago… And I have encountered a few real runaway (chemical) processes in my working life later on, quite dangerous, but luckily without personal injury. It is simple: as long as the positive feedback from clouds, water vapor etc. on temperature is less than unity, the additional temperature is less than the original temperature increase, thus that results in a smaller increase of clouds, water vapor etc. feedback and the overall net gain for each step decreases asymptotically until zero. The total result is an increase in temperature higher than without positive feedback, but no runaway effect. Positive feed back in any system including the earths climate, must be controlled or the system will destroy itself. Thus we see systems such as Willis’s thermostats in the tropics kicking in and negating the heat input. Input positive feed back negative,balance comes out. AGW is BS. The only way the Earths climate can change is if the input changes, then we have a new setting for the thermostat, either higher or lower. Our world is heated by the sun and internally stirred by it’s machinations , it is temperature controlled by our own refrigerant water, in it’s various guises. Belief in the magic pudding of positive feed back as espoused by some in power will be our downfall, but not by overheating. First comment, first paragraph: I have never checked on the details of Modtran’s modeling of the CO2 absorption spectrum. What is the presumed effect of its not modelling the pressure broadening in full detail? First comment, second paragraph: Modtran offers a choice of entering water vapor by its pressure or by relative humidity. Identical numbers for this produce identical results for either choice. I presume this is a convenience for the user according whichever type of data he has available. The number entered is the multiplier of the normal level of vapor and it doesn’t matter what the name choice is. Second comment, number 1: Are you talking about saturation being accounted for in Modtran? It is accounted for in Modtran, but one cannot determine the degree of saturation in a single calculation. To determine the feedback effect with Modtran, one does successive calculations with equal incremental changes in the parameter causing the feedback. If the corresponding changes in the resulting forcing function decrease decrease, feedback is negative and it is positive if they increase. Second comment number 3. All cloud albedo has a negative effect (negative feedback) because it means reflection of incoming energy thereby decreasing the temperature forcing function. Each is available. Reply with a comment requesting which one and supply your email address. Just scanning, I see too many errors to warrant a more complete waste of my time. Positive feedbacks: methane from melting tundra, warming hydrates in the ocean, and loss of albedo due to melting ice. Clouds can be positive or negative. Carbon 14 loss after the atomic tests is due to MIXING with the oceans, and unrelated to loss of EXCESS carbon over time. The pity is, a valuable researcher must waste time documenting the errors in this report, while the denier blogs will propagate its false conclusions. 2. 3% of the CO2 entering the atmosphere each year is from human activities (the overwhelming 97% from natural sources, according to the IPCC itself). These two numbers were conveniently excluded out of fear anyone would be able to prove that man-made global warming is statistically immaterial and scientifically irrelevant… back radiation or no back radiation… positive feedback or no positive feedback! Based on the above two universally accepted percentages, 5% of the GHE is attributed to greenhouse trace gases of which CO2 represents about 72%, which in turn represents about 3.6% of the GHE. But we are not talking about all the CO2 in the atmosphere. The IPCC blames catastrophic man-made global warming (aka climate change) on the human contribution of CO2… the 3%. This being the case, it can be stated that the human contribution of CO2 to the GHE is therefore only about 0.11 of 1% (3% x 3.6%)… in nutshell, close to one tenth of one percent of the GHE. Who in their right mind would claim such an insignificant human contribution of CO2 is therefore a huge threat to Earth’s climate or is capable of driving huge changes in the GHE? One does not have to be an atmospheric physicist to work this out. Human CO2 is too insignificant to have any major impact on the climate. Besides, CO2 is not a meteorological parameter.